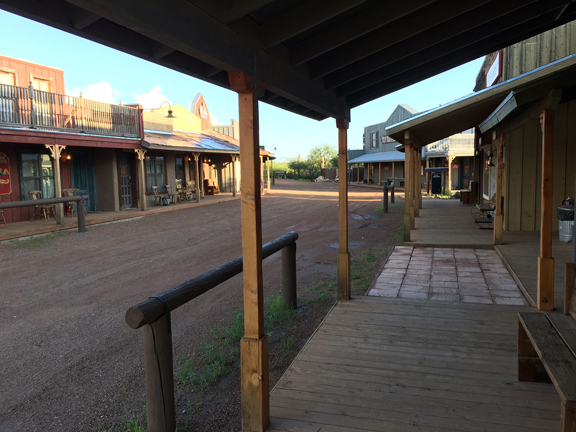 Back from my quick trip down to Tombstone. Stayed at the delightful Monument Guest Ranch which was built by some crazy Germans who love the West. They allegedly spent over $5 million on the property which they originally called "Apache Spirit Ranch" which was a tad misleading since they are a stone's throw from Tombstone. Anyway, three years ago my friend Russell True, of White Stallion Ranch fame, took over the property and has been running it ever since. My talk to the Chamber was in the barn on the ranch. 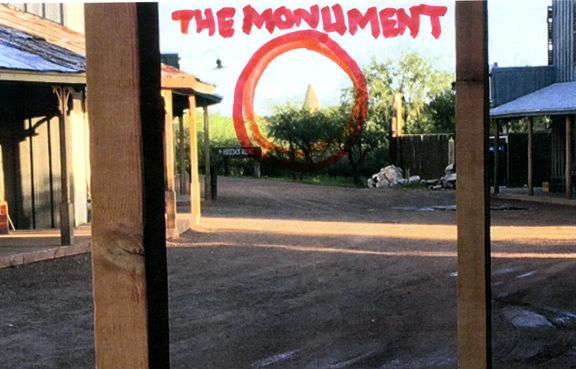 Monument Guest Ranch, outside Tombstone, Arizona, 6 a.m.
How Do We Thrive And Keep The Old West Alive? 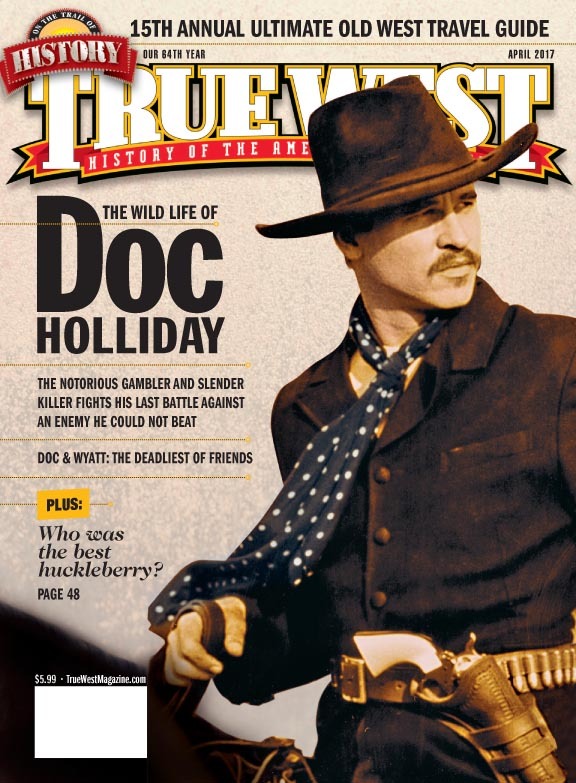 "I believe True West magazine and the town of Tombstone are in the same boat. We have to compete in the wider world for customers (in my world we call them "eyeballs"), and, as everyone knows, this wider world is a very chaotic marketplace right now. In my humble opinion, we have to adapt, or die. "There was a time when we could merely beckon to the public with the true history of what happened in Tombstone and people would respond, some would even show up, or in our case, subscribe. But those days are diminishing and one of the definitions of insanity is doing the same thing over and over and expecting different results. "Last weekend's appearance of Val Kilmer in Tombstone, underscores my point. A record crowd showed up to see him. We have had similar results when we put him on the cover of True West. We sell about 25% more magazines on the newsstand when Val, or Robert Duvall, or Hugh O'Brian, or, as in our latest issue, Powers Boothe appears on the cover. Val Kilmer on the cover of our April issue has been our highest selling issue of the year. These extra sales can mean the difference between thriving and going broke. The simple fact is, we live in a celebrity culture. Now, the trick is, how do we utilize this powerful magnet without appearing to 'sell out'? Well, it ain't easy. We have tried our best to provide solid history inside the magazine, but we tease that history with Val Kilmer on the cover. So far, it's working. "My advice for Tombstone is to do more events with popular culture figures to bring in the crowds. I saw a first time event in Ridgeway, Colorado draw 10,000 people with the addition of Angie Dickinson, Kim Darby and Johnny Crawford. Imagine what Tombstone could do with a Kurt Russell next year? One warning: he ain't going to be cheap, but it sure beats dying on the vine. "In addition to the early history of Tombstone, I know a few things about the current history. So, good luck with getting any of this done." "A committee is a group of important individuals who singly can do nothing but who can together agree that nothing can be done." In my opinion, to bring this new generation into the fold you must entice them with some popular culture in order to get them interested in the subject matter. I believe many a young person in the 40's, 50's, and 60's, became interested in the old west after seeing their favorite stars in the western movies. I don't see it as diluting the bulk of the magazine at all. So true, Pam. robert Utley's passion for Custer began with a viewing of "They Died with Their Boots On". Future generations were similarly affected, but the movie was "Little Big Man". I see nothing wrong with how Bob Bell and the True West staff are reaching out, and attracting the younger generation. It's the smart thing to do, and it is necessary in order for TW to survive. I find the art of the west inspiring. Keep up the good work! so, speaking of expensive, let's approach dustin hoffman to appear next year as Jack Crabb IN MAKe-UP for a live interview with you(since they skrrewed up filming the sequel to "little big man" (from thomas berger's wonderful book, 'the return of little big man'). it might be as big a ticket to watch the original make-up man apply the make up beforehand, as Dustin Hoffman drops into the character...he's older now, so the time ratio would be less! hah!! ~food for thought! Billy The Kid Keeps Circling Back. Why? Don't Touch My Hat Jack! Are You Satisfied Mrs. Wild Bill? The Best Frank James In A Movie, Ever? Hey, You Get A Load of My Clouds!